: Ultra - Clear - Slim, transparent protective bumper case reveals and enhances the original color of your phone. 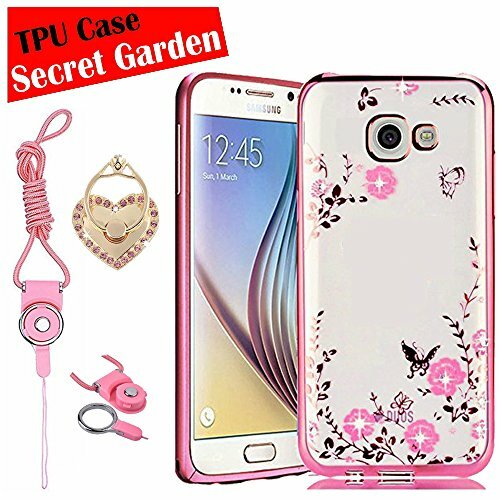 : Secret - Garden - Design, Pretty rose gold coating pink flower with bling glitter stone diamond on case can be beautify your phone. : Premium - Protection, Shock-absorbing frame that protects against drops, Protects your device from scratches, bumps, dings and other daily damage. : Easy - Use and Install, Cutout design for Speaker, Screen, camera and ports, easy access to all ports and connectors without removing. Registered brand : eBuyLife. Registered by "Easybuylife". Copyright by "Easybuylife". Only allow "Easybuylife" sell. Please buy the genuine products provide by "Easybuylife". 1. 100% Brand New with High Quality. 2. Unique design, Slim, Lightweight and Form-fitted. 3. Pretty floral bling glitter clear case with Rose Golden edge for option. 4. The case is made from Flexible Thermoplastic Polyurethane (TPU) and IMD (In-Mould-Decoration) Technology. Make the Print Vivid and Never Fade. 5. Special pattern on the case makes your phone different and eyes-catching. 7. Corner Protection: Four edges are thickened to 1.5mm, strengthening anti-shock effects of four edges and resisting falling impact. 1 Pcs x Case (Not contain the phone). 1 x Neck and Hand two use Lanyard. 1 x Heart Ring stand.